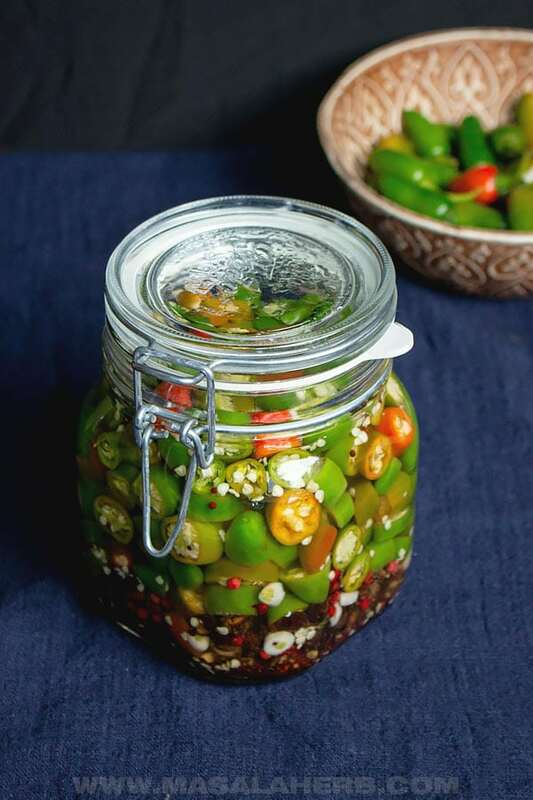 A quick refrigerator pickled jalapenos Recipe, so that you can preserve and enjoy these beautiful jalapenos. I’m sharing a basic jalapeño pickle recipe with flavor and ingredient adjustments, tips and ideas. 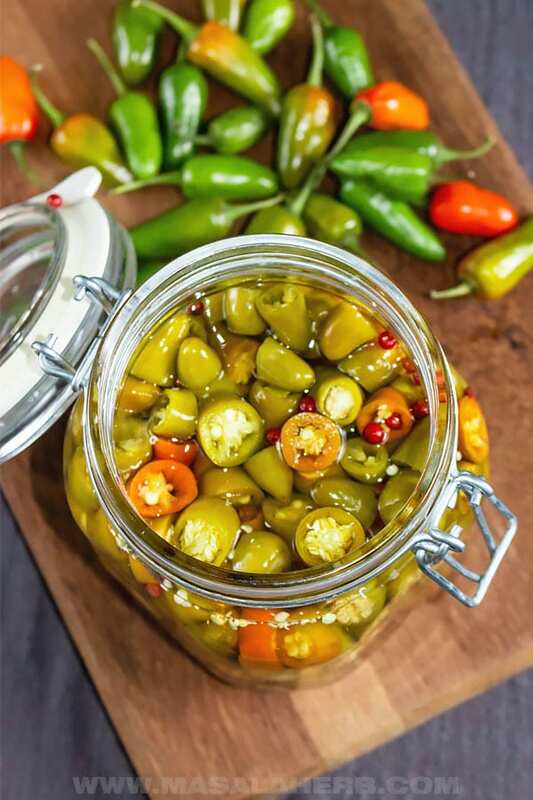 Pickled Jalapenos are preserved in a vinegar, water, and salt solution to increase the shelf life of fresh peppers. Jalapeno pickles are common Mexican homes, where they prepare quickly pickled jalapenos any time of the year to store in the fridge. They are better known as jalapeños en escabeche in Spanish. Fresh Jalapenos can be pickled as a whole or cut into slices. Canning whole jalapenos results in peppers that are crunchier for over a longer period of time. Those are great to prepare pickled stuffed jalapeno poppers. Sliced Jalapeno pickles, on the other hand, give you the freedom to remove some of the seeds if you want to tone down the heat. However, sliced jalapenos can get soggy faster and lose their crunchiness in time. Usualy green jalapenos are pickled but you can use red ones as well. Just know that red ones might be a bit sweeter but they tend to be even hotter at times. The heat of jalapeños can not be really determined on the outside. I have come across super mild bell pepper-like jalapenos, as well as super hot jalapenos. If you want to tone down the heat in your pickled jalapeño pepper recipe, than remove some or all the seeds. Use gloves to cut the Jalapenos, because it can burn! I didn’t in the video because I forgot (and they look ugly in the video). Wash your jalapenos well, cut off the stem and slice your jalapeno. I found that cutting thicker slices keeps the peppers crisper over a longer period of time. Keep a clean sterilized jar ready and place jalapeno slices into it. You can also add your spices to the bottom of the jar if you like. ( I did that in the video). Bring the vinegar, water and salt to a boil in your pan. Pour the hot brine over the jalapenos in your jar. Close and leave the jar out for 2-3 days before refrigerating. Do pickled jalapenos need to be refrigerated? Yes! 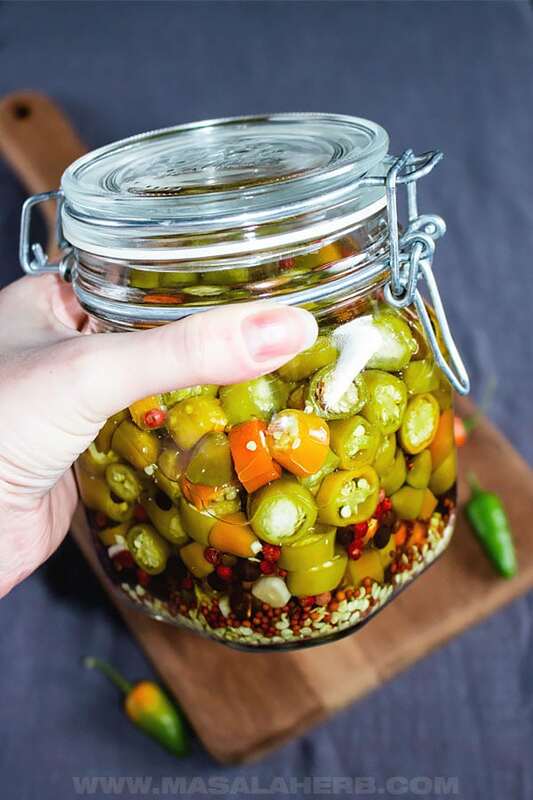 Store the pickled jalapenos in your fridge after the slices sat in the vinegar solution for 2-3 days in room temperature. That way your refrigerator pickle peppers will last longer. How long do pickled jalapenos last? If you have followed all the outlines steps correctly to the T, than your pickles should last for a few weeks, 1-2 months. BUT, try to consume them as soon as possible because the refrigerator pickled jalapeños taste better when they still have some crispiness to them. The pickled jalapeño peppers are not that great when they are soft, soggy and limb. You know I love adjusting my recipes with spices and herbs! So, for these mexican pickles I ended up creating flavor variations, which were quiet the hit at home. Pickling Spices – I mix a set of flavor lending spices together, add them to the raw jalapenos. Spices such as mustard seeds, black/green/pink peppercorn, caraway seeds, allspice and garlic. Flavored Vinegar – I love to add my herb infused Vinegar or other fruit infused or flavored vinegar such as Coconut Vinegar or other Gourmet Vinegar. Other Ingredients – Such as carrots, turnips, and radish or even small onions, cucumbers and boiled eggs. Pickle your own jalapenos at home. Canning jalapeno peppers has never been easier! Tip: Use gloves if your jalapenos are spicy hot or if you have roughened up hands. Wash your jalapenos well and cut off the stem. Slice your peppers. Now grab your jar. At this point, you can add in whole spices if you like to add flavor to your pickled jalapenos. Place your jalapeno slices into the jar. Heat up a saucepan to create pickling brine with the vinegar, water, salt, and sugar. Mix well and bring to a light boil. Pour the brine over the jalapenos in the jar. Make sure all tour pepper slices are covered by the brine. Close your jar and leave your pickle out in room temperature for 2-3 days. Test after two days if your pickle is ready to be refrigerated. It should taste like a pickle. Store in the fridge until further use. You have the option of adding pickling spices. I like to add a combination of mustard seeds (yellow or brown), black/green/pink peppercorn, caraway seeds, fresh garlic sliced and allspice berries. Add as much as you like to your jar before placing the sliced raw jalapenos into the jar. Use a Vinegar with 5% acidity. If it’s a stronger vinegar add some more water to even it out and if it’s a lighter vinegar, add more vinegar than water. Keep around 2-3 days out in room temperature before refrigerating so that the jalapenos take in the flavors and get properly preserved in the brine. Refrigerate after 3 days for up to 1-2 months. They usually are not that good anymore when they are soggy and soft. For the Jar, I use Italian 3/4 liter Bormioli Rocco Jars which come with a rubber. Those are of great quality and perfect for canning jalapenos. I wholeheartedly recommend you get these thick glass jars for your homemade pickles. 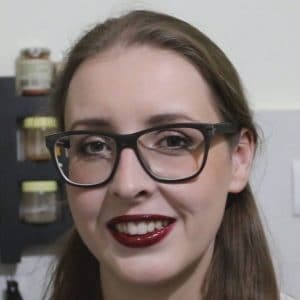 Dear Reader, did you add pickling spices to your canned jalapenos? I love pickled peppers!! 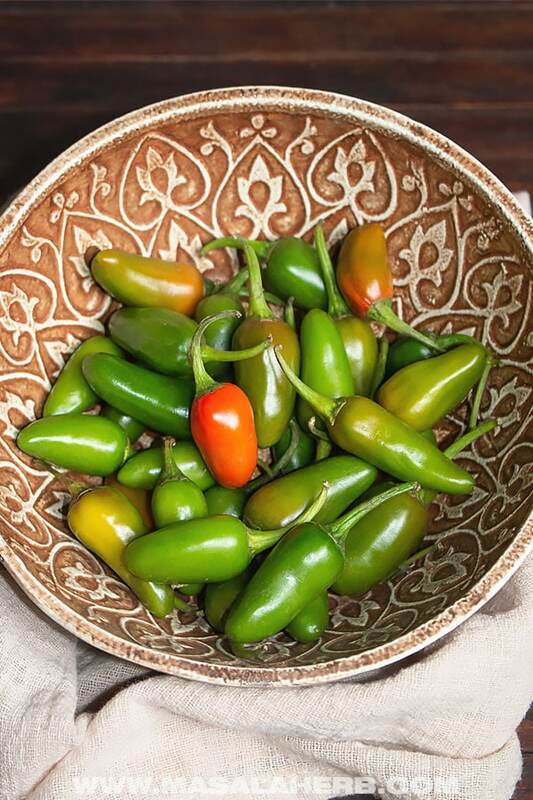 Can’t wait to have some homegrown jalapenos to give your recipe a try. 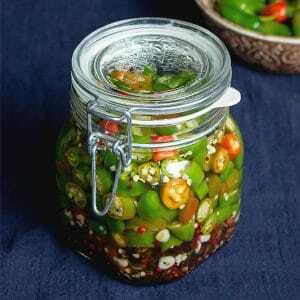 Hi, this may be interesting you: Quick Pickled Jalapenos Recipe!